The Department of Communication Studies offers many kinds of events, most free and open to the public. We organize and sponsor numerous lectures, workshops and conferences over the course of the academic year. Our programming covers a wide range of topics and features presenters from diverse disciplines and is designed to foster an understanding of the mass media and emerging media. 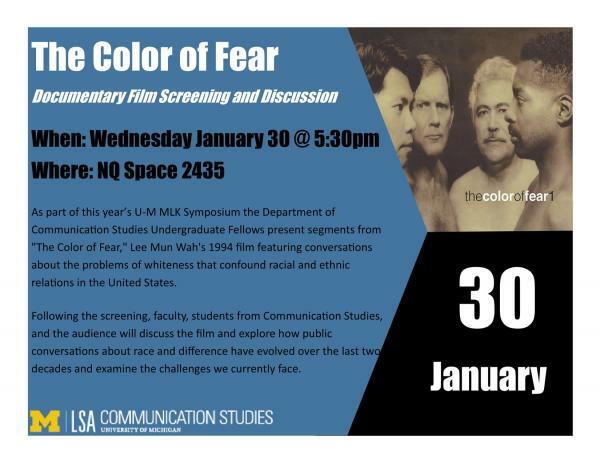 The Department of Communication Studies Undergraduate Fellows present a screening of "The Color of Fear," Lee Mun Wah's 1994 film featuring conversations about the state of racial and ethnic relations in the United States. Following the screening, faculty, students from Communication Studies, and the audience will discuss the film and explore how public conversations about race and difference have evolved over the last two decades and examine the challenges we currently face. No RSVP necessary. This event was rescheduled from January 30, 2019. 2012 Marsh Lecture: Stephen Bloom on "Can We Wean Ourselves From The Kardashians?" 2013 Marsh Lecture: Vanessa Gezari on "The Tender Soldier"